We’re making a modest start with Top Dog in the month of August, 2014. At Queen City Dog Training Club in Cincinnati, Ohio we’ll run a tournament of three challenge courses with no more than 40 dogs. This has been called the YouTube Invitational. The idea is that we will post results of the tournament in this BLOG, including a link to the YouTube recording of each of those performances. Anybody who sets up the course, anywhere in the world, will be included in those results. Anyone (club, group or individual) may set up any or all of the Challenge Courses. For results to be recorded for this event the courses must be run in the month of August, 2014, and results must be reported by midnight on August 31, 2014. We are honored that our courses for this challenge were designed by Stuart Mah, a judge and competitor with a tremendous depth of knowledge and skills, a beloved old-timer, and a pioneer in the sport of dog agility. The judge for the event at Queen City on August 5th is Brenda Gilday. Brenda is a popular judge for Canine Performance Events (CPE) and the Teacup Dogs Agility Association (TDAA). This is a simple numbered course. The scoring basis is: Time, Plus Faults. Follow the numbers, keep the bars up, hit the paint. And have fun. 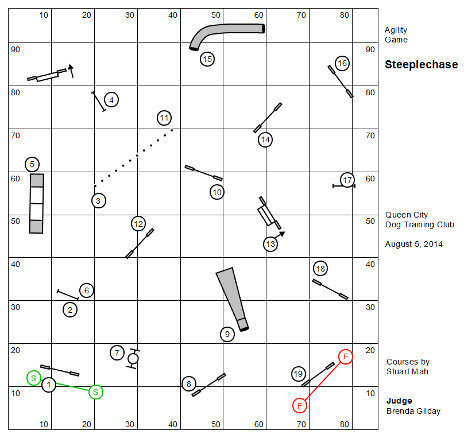 This is a simple game, run like a standard course. The Scoring Basis is Time, Plus Faults, Less Bonus. 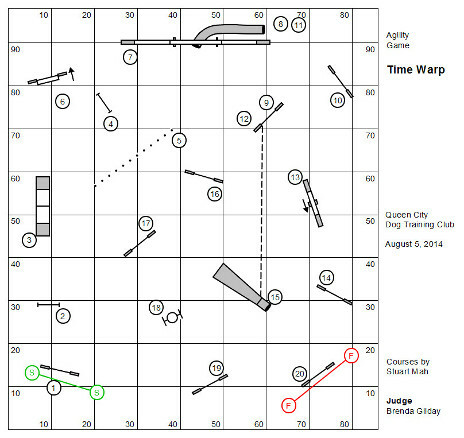 There is an opportunity on this course to earn a 50 point bonus which is subtracted from the Time, Plus Faults part of your score: If you can stay on the opposite side of the containment line through your dog’s performance of obstacles #12 through #15, then you will earn a 50 point bonus. Note that the bonus is not lost for any faults in the distance challenge. The course will be used for the league challenge. The event at Queen City is intended to be a role model for the conduct of a league competition. A league team represents a community of agility enthusiasts. The team itself is limited to five dogs. The performance scores of these five dogs will be the team score. Dogs will be scored observing TDAP rules for performance, and are eligible for TDAP titles and honors. The five league dogs must be identified before the competition. That last bullet is an important bit. At Queen City we will be running maybe 40 dogs in the competition. We can not run the 40 dogs and then pick the top five scores to represent the league team. Consequently, the first two games are intended as Qualifying rounds. Each dog’s combined scores from those games will represent their qualifying score. The top five dogs from the Qualifying rounds till be delegated the league team. That is not to say that this is the only way for a club or group to define their official league team. Flipping coins would be an acceptable method for selecting the team, as would “hand picking” the team. The only stipulation is that the team must be defined before the competition. We need an earnest discussion about the “agility league” especially and obviously as it relates to Top Dog Agility Players. 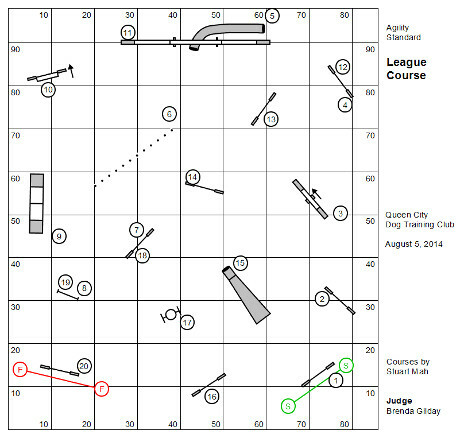 Just a couple days ago we published an Introduction, which outlines how the opening night of league play will work at Queen City Dog Training Club in Cincinnati, OH on August 5, 2014. And now, the real question for which inquiring want an answer. Why is the final league team randomized? Why not come into a competition with a team already assembled. After all, that builds team spirit and camaraderie. Bear with me on this. One club only gets one team. Can that club preselect the team? Of course they can. What we have at Queen City is a competition to which about 40 dogs will be invited. Why would they show up if “the team” were already selected? What we’re going to do is have two rounds of qualifying courses or games. Every dogs placement against the field accumulated over the two rounds will determine who gets to be on the five dog team. And then, in the final round, the scores earned by those five dogs will constitute the score of the Queen City team. And this is the score will be recorded against any other teams that report a score for league play. A league must have rules. One of our really basic rules is that the team must be selected before running the challenge course. It would be unfair (and, obviously, against our rules) if we ran 40 dogs on the challenge course and afterwards picked the top five scores to represent the team score. That wouldn’t be a team at all. At this point we don’t even know if other clubs around the country (or around the world) will compete with the Queen City team. This isn’t going to be a quick and easy start-up. If you are going to play, or feel like you want to… get in touch with me. I’ll help you get started! ~ Bud Houston Houston.Bud@gmail.com. Come out and play with us! On August 5th the Top Dog league competition at Queen City Dog Training Club, Cincinnati, will be the focus of the internet-streaming television program The ^Agility Show. Everybody in the world is invited to compete against the Queen City Team. What you need to compete? A trained agility dog, registered with TDAP. It’s free at the moment. Click HERE. A field measuring at least 86′ x 98′. A good set of agility equipment. A judge familiar with Our Rules. A day in August to make it happen. A copy of courses and briefings, and scorekeeping materials. Click HERE to download. This should be a lot of fun. The courses for this event were designed by the incomparable Stuart Mah. Our guest judge in Cincinnati will be Brenda Gilday. Who your judge will be, I cannot tell you if you’re not attending the Queen City Event.